We recently were treated to videos of the eruption of an undersea volcano. (See Video ). Similar volcanoes erupted during Precambrian time (about 1.7 billion years ago) in what is now Arizona. Some of them produced mineral deposits called volcanogenic massive sulfide deposits that contain copper, zinc, lead, silver, and gold. 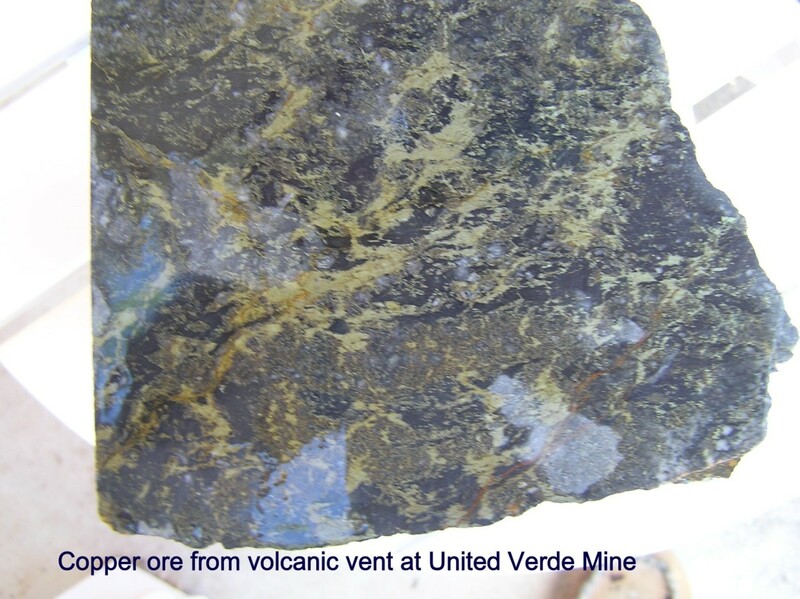 About a dozen such deposits occurring in northern Arizona have had some production, the largest known of which is the United Verde mine at Jerome. In such deposits, a shallow magmatic source under the sea bed provides heat which sets up a convection cell in the surrounding rocks. 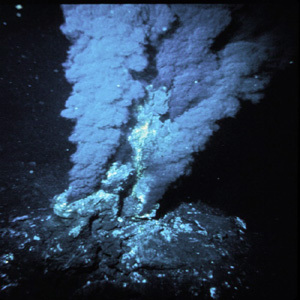 Sulfur and metals derived from the volcano and from leaching of the sea floor sediments are erupted into the sea and deposited as sulfide-rich sediments. The sulfides often form a chimney called a “black smoker”. 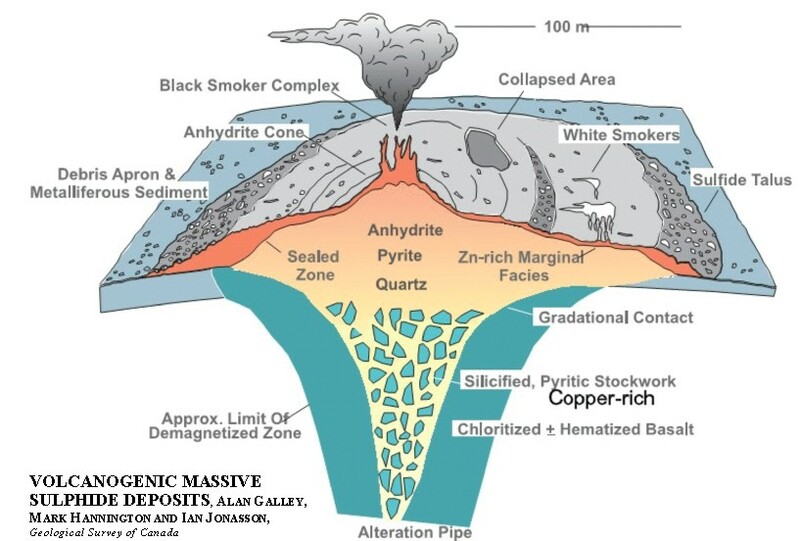 The sulfide-rich “clouds” are taken by ocean currents and eventually settle to the sea floor, around the vent, to form layers of sulfide material containing pyrite (FeS2), chalcopyrite (FeCuS2), sphalerite (ZnS), and galena (PbS), together with the sulfates anhydrite (CaSO4) and barite (BaSO4). The volcanogenic massive sulfide deposits at Jerome are zoned, with the copper-rich portion in the volcanic vent and on the ancient sea floor adjacent to the vent. 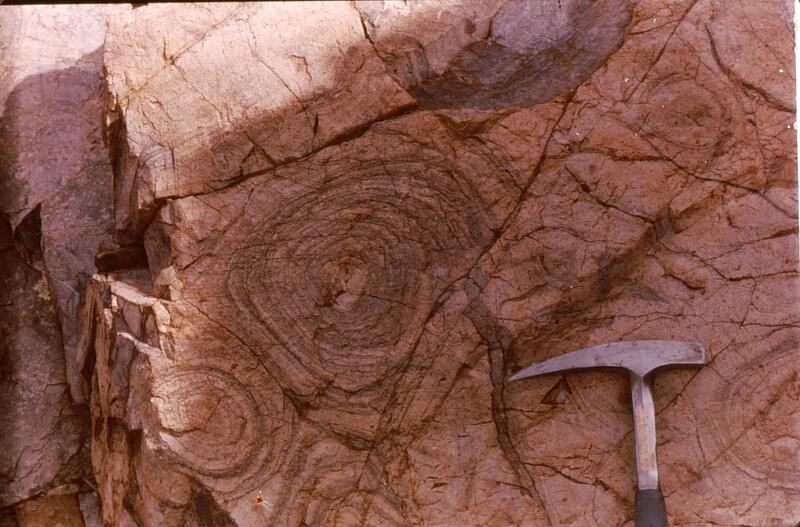 Zinc and lead sulfides, with iron oxide occur as marginal banded sediments, and banded iron and silica deposits occur at the extremities. The photo below is copper ore from the volcanic vent at Jerome. The brassy material is chalcopyrite. The darker material is chlorite, an alteration product. The next photo shows the banded zinc and iron mineralization. Notice that these bands are folded. The circular structures in the photo below are cross-sections of the black smoker chimneys formed during eruption and preserved by the erupted material. The deposit at Jerome is far from the idealized drawing above. In the approximately 1.7 billion years since the deposit was formed, it suffered several episodes of folding and faulting. The following cross-section by Paul Lindberg, shows the structure as currently understood. 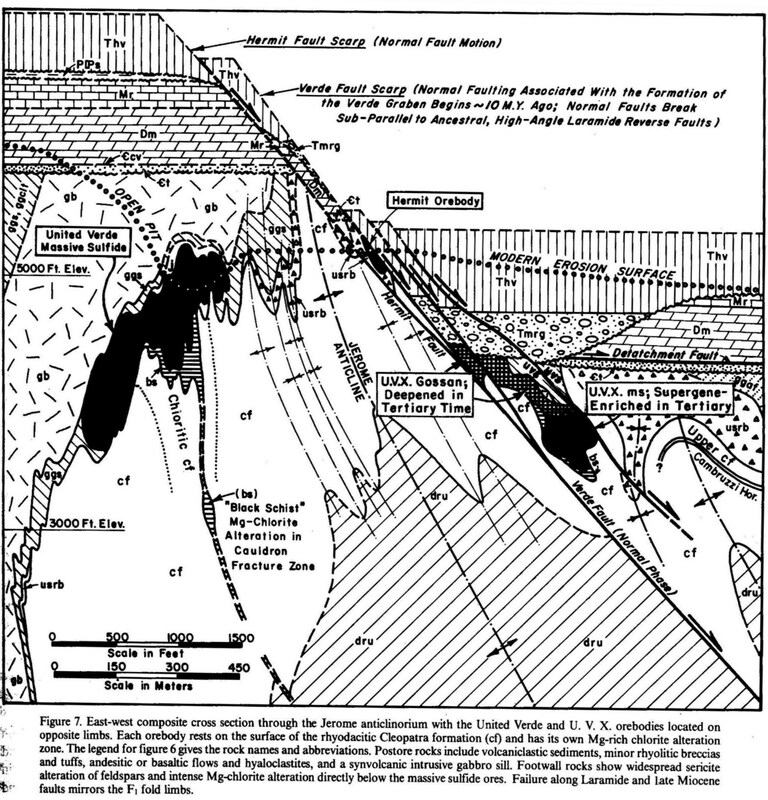 Lindberg hypothesizes that the volcanic vent was along the edge of a caldera (cauldron fracture zone). Besides the main United Verde body, shown on the left side, there are two smaller deposits which have been faulted off the main body, the Hermit orebody and the UVX orebody. The graphic below is a west to east section looking north. The town of Jerome sits just west of the fault above the Hermit orebody. Production from the Jerome deposits totaled about 3.6 billion pounds of copper, 97 million pounds of zinc, 693,000 pounds of lead, 1.6 million ounces of gold, and 57.3 million ounces of silver. And there is much more remaining, just waiting for the right opportunity. 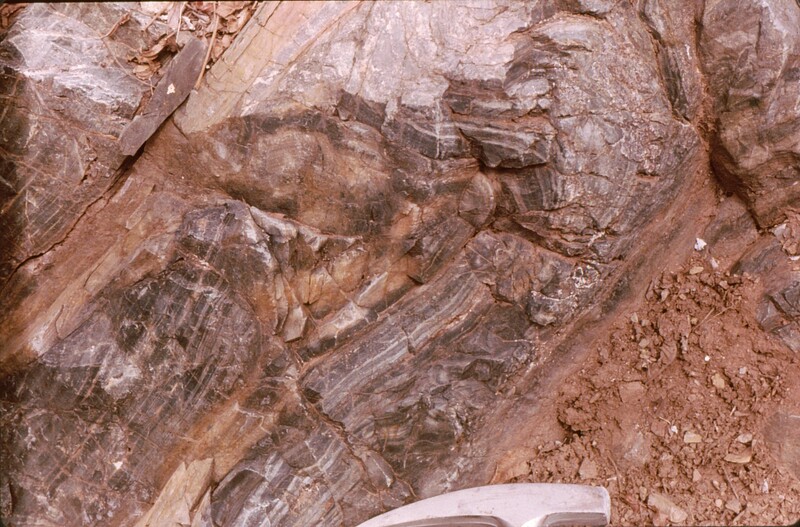 Lindberg, P.A., 1989, Precambrian ore deposits of Arizona, in Geologic Evolution of Arizona, Jenney, J.P. and Reynolds, S.J. eds., Arizona Geological Society Digest 17.